With house prices rising smartly, homeowners should be celebrating. Right? Wrong. To be sure, a 10 percent jump in house prices in the first quarter, compared with a year earlier, pushed more people out of the red and into the black. But one in four U.S. homeowners with a mortgage still has “negative equity:” the mortgage exceeds the value of the home, according to new data from Zillow. These 13 million U.S. homeowners will need more price appreciation before they can feel that the housing-market downturn of the previous decade is truly over. Negative equity is prevalent not just in obvious places like Las Vegas, once the poster child for the go-go real estate market that went bust. The painful aftermath lingers in Chicago and Minneapolis, where about one in three owners has negative equity. Seattle, Cleveland, and Baltimore also each have a larger share of owners in negative territory than the national average. 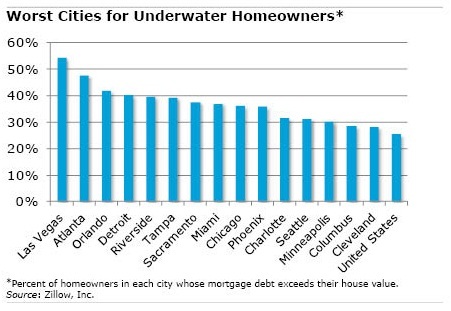 Zillow computes a second, broader measure of underwater homeowners. It adds together people with negative equity and those who have some equity, though not enough to pay a real estate agent and related costs to sell their house and move. When this second group is included, the share of home borrowers in a financial bind increases to 44 percent, from 25 percent, Zillow said. To calculate its misery index, Zillow on its website estimates home values based on sales prices in each house’s neighborhood, as well as tax records and other data. It then compares property values with mortgage balances provided by TransUnion, a credit-rating agency, to determine the share of owners who are underwater. So why does this index really matter? In theory, lower house prices are only paper losses for people who intend to live in their homes for many years. But negative equity can prevent some people from using their house to improve their personal finances. Banks, for example, don’t like to refinance a mortgage at a lower interest rate if the owner doesn’t have equity. It’s also more difficult for people to relocate for a new or better job. And retirees with negative equity can’t use their home to generate extra income. In another blog post this summer, Squared Away will explore new research about the continuing impact of the housing-market slump. As an Orlando mortgage professional, I can certainly vouch for the accuracy of these statements…at least locally. The good news is that as long as their credit is still intact, there are special upside-down refinance options available. They are called HARP 2 (for Fannie Mae and Freddie Mac loans) and the FHA Streamline refinance. I strongly encourage anyone feeling trapped by their mortgage to call a local, seasoned mortgage pro to discuss their options. Knowledge is power, pass it on! In one of the great lines in the novel, “Bread and Wine,” a landowner says the peasants are in many ways better off than he is, because they are “used to suffering.” The same with younger generations.